How to Create a Sustainable Pinterest Strategy. When we gain new knowledge, it's exciting to implement what we've learned. The problem is that only a small percentage of people continue to implement what they learn because they feel overwhelmed. This strategy guide download (below) will allow you to incorporate everything that you've learned in this course and build a sustainable strategy that you can maintain on an ongoing basis and continue seeing growth. Here are some additional tips to incorporate into your strategy for optimal growth and visibility. 1. 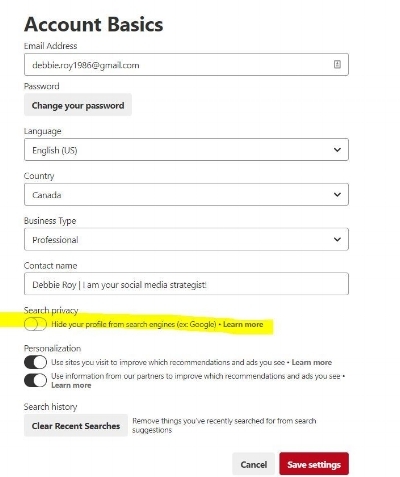 Ensure that your search privacy is turned off. You want your profile to be searchable, this is crucial to your Pinterest success. 3. Embedded some of your boards on your website or blog. Visit the board and create a widget and copy the code on your website where you want the board to appear. You can even customize the size and how you want it to appear. 4. Repin up to 70%-80% of your original content, this is a form of recycling your content and will allow you to show to your newer audience what you're all about. 5. Engage with the followers of your competition. Comment on their pins, rePin some of their useful content and follow some of them. 6. Just like you advertise your other social networks on your various social media platforms, don't forget to do the same with Pinterest. Invite your followers to also follow your Pinterest account. Don't forget your Pinterest Strategy Guide download below!